The first horse of the Stats Accumulator comes from Ludlow in the Class 4 hurdle contest over 2 miles and we have selected Elysees to go on and win this race. This Alan King trained three year old has only raced twice in his career and last time out scored at Warwick with plenty left in the tank and looked like a smart juvenile. This trainer is running at a strike rate of 25 percent over the last 14 days but better than this when his horses are turned out within seven days after winning and he has a 38 percent strike rate when this happens and this is the case for Elysees. The second selection of the day comes from Clonmel in Ireland in the Listed mares chase contest over 2 miles 4 furlongs and we have gone with the Willie Mullins trained Camelia De Cotte to place. This six year old holds a lot of potential for this yard and when seen last time out came a disappointing fourth but hit the second to last fence hard and never recovered. Before that she was unbeaten this year showing a lot of scope to improve. Willie Mullins is a top trainer and loves it at Clonmel having a 48 percent strike rate for the past year. This is similar for jockey Paul Townend who is running at 36.36 percent at this track over the last 12 months. 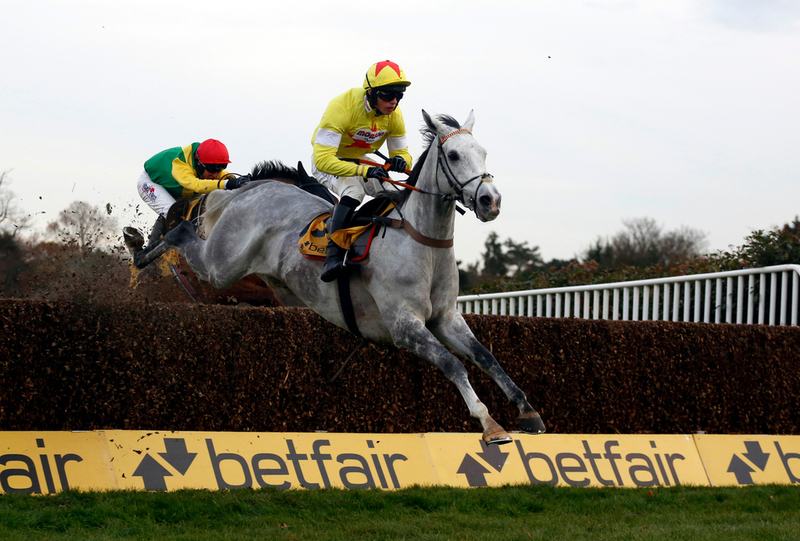 The penultimate horse of the stats bet today comes from Chelmsford on the all weather in the Class 3 novice fillies contest over 1 mile and we have gone with Queen Of Burgundy to finish in the top three. This William Haggas trained two year old has only had one run and she finished a poor sixth. Haggas' horses normally need a run and hopefully she will have learned a lot for that run. James Doyle is on board today and he is currently running at a strike rate of 29 percent for the last 14 days with Haggas running at a 30 percent strike rate over the last 2 weeks. Together they work really well together and have a strike rate of 30 percent for the last 12 months and with this today the jockey loves it at this track posing a 30 percent strike rate when rising here. 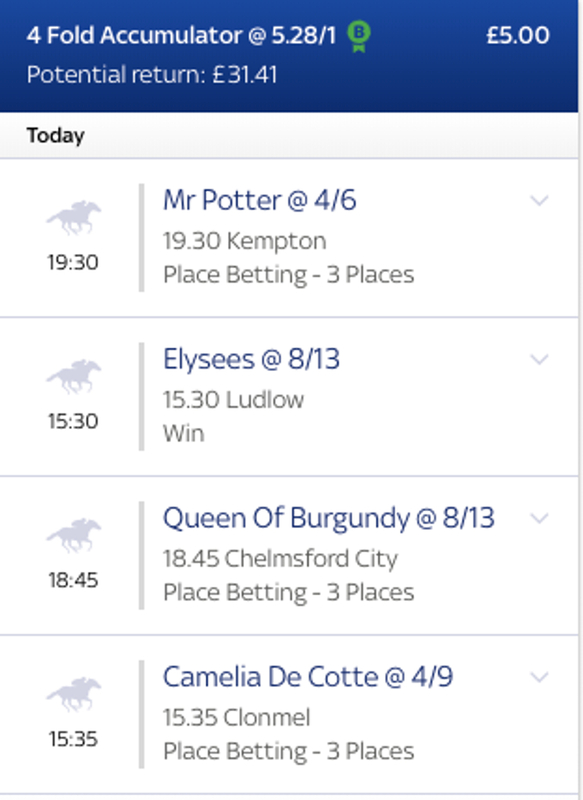 The last horse of the Stats Accumulator with Sky Bet comes from the night meeting at Kempton in the Class 6 handicap over 6 furlongs and we have selected Mr potter to place. This five year old trained by Richard Guest has been in great run of form in his last few runs placing in four of his last six runs and going on to win one of them over this distance today. His trainer Richard Guest has also got his horses performing at a high level recently running at a strike rate of 33.33 percent for the last 14 days. With this, the jockey in the saddle today is Philip Prince and over the last 14 days he has a 50 percent strike rate.